The award recognizes the use of an EBD process in the pursuit of increasing value, improving outcomes and engaging stakeholders. Awards were presented to projects that showed exemplary achievement through collaboration, evaluation and sharing: the touchstones of the EBD process. Located near the hospital’s Family Birth Center and Cardiovascular Intensive Care Unit, the 6,800-square-foot open-terrace garden is accessible round-the-clock to all hospital patients, visitors and employees. Called “A Nature Place,” the garden incorporates the elements of portal, path, destination and surround. The Legacy Emanuel garden was also the setting for an in-depth research investigation on nature to combat stress and burnout among nurses. The groundbreaking study was published in the November 2018 American Journal of Critical Care: Impact of Nurses Taking Daily Work Breaks in Hospital Garden on Burnout. Nature presents us with a very real means to address workplace burnout. 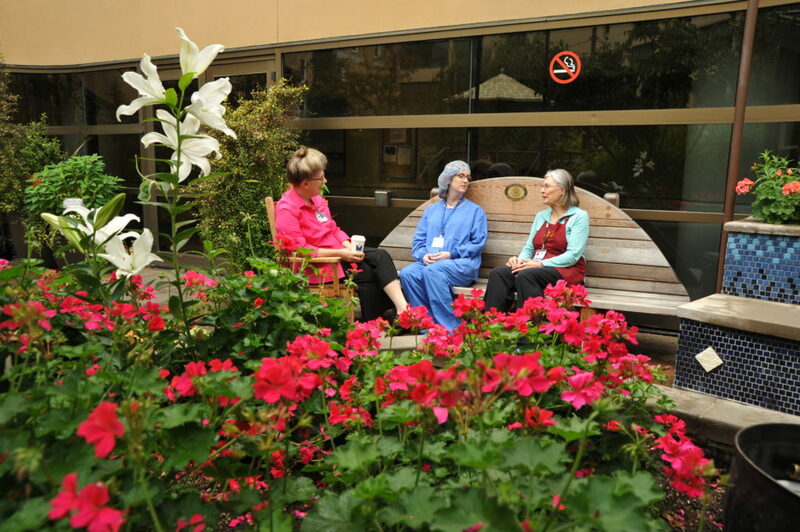 In this study, once daily, nurses spent a brief break, which lasted approximately 20 minutes, in a hospital garden; and a positive effect was noted after just 6 weeks. Meaningful green spaces represent an achievable means to help tackle burnout - and not just in hospitals, but in all kinds of workplaces. Roger Ulrich, Ph.D., EDAC, co-project investigator and a pioneer in landscape design, said: “There is a pattern of evidence that suggests that well designed gardens can reduce stress, lower blood pressure and relax people.” Dr. Ulrich is a guest professor of architecture at Chalmers University of Technology, Gothenburg, Sweden and Emeritus Professor at Texas A&M University. According to Dr. Ulrich, anything that can be done to improve staff morale and help nurses cope with intense job demands and stresses can potentially help hospitals and other health care providers deliver better quality care. The in-depth study of the restorative benefits of therapeutic healing gardens was funded by a $560,000 Open Spaces Sacred Places grant from the TKF Foundation, which supported a cluster of studies at Legacy Emanuel, including the one described here. “Philanthropy is a vital spark for innovation and scientific breakthroughs. Taking findings and transforming them directly to improve medical care. . . that’s what Legacy Research does best,” said Joe Frascella, Ph.D., vice president of Legacy Research Institute. A recent Gallup survey found that burnout impacts as many as two-thirds of American full-time workers to some degree, with 23 percent reporting feeling burned out often. Among nurses, a third are believed to experience high levels of burnout. It is a pressing problem that cuts across occupations of all kinds, industries and settings. For workers, it can eat away at their mental and physical health in a myriad of ways and can even shorten lifespans. An estimated $125 - $190 billion in health care spending is attributed to burnout each year. “Heart of the Hospital” film features Legacy Emanuel Terrace Garden: The short film, “Heart of the Hospital,” explores the design and healing role of the therapeutic garden at Legacy Emanuel to improve patient care and outcomes. It was selected by the SHIFT Festival film committee to screen at their October 2018 conference.